The browser is the gateway to the internet, and if your browser is slow, you will also have a bad internet experience. Unfortunately, no matter which browser you are using, it will slow down after some wear and tear. When you browse the internet, you are saving loads of data including cookies, cache, browsing history, temporary files, form data, passwords and more. All this data can lead to a heavier browser, thus affecting the performance of the browser. You can delete most of this data to gain some of the performance back. However, the browser data is not located in one place, and it would be a very tedious task to delete all of the data manually. Thankfully, there are many free browser cleaner tools available that will automatically clean your browser and help keep it in tip-top condition. Most of these free browser cleaner tools give you complete control over what you want to delete, so you should not worry about them deleting any important data. Additionally, you can also set up automatic cleaning schedules to keep your browser clean without any manual intervention. In this post, we will list down five browser cleaner tools that will keep your browser clean and fast. Without any doubt, CCleaner is one of the best browser cleaner tools you can get for your PC and browser. It comes with a free version that offers all the functionality, but you can opt for paid version to get automatic updates and support. 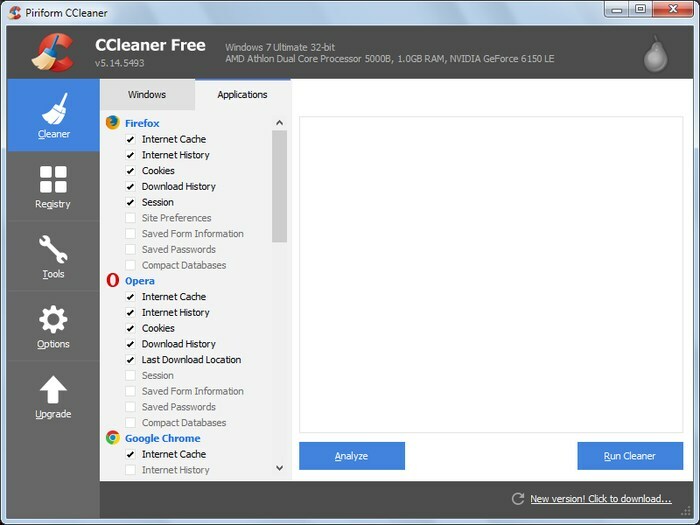 Although CCleaner is excellent at cleaning Windows junk files, we are going to focus on its cleaning features for the browser. It will detect all modern browsers installed on your PC and let you clean all of the collected data including, cache, history, cookies, downloads, sessions, saved passwords and form entries and more. These options should be more than enough to keep all your browsers clean. It also comes with some extra tools that you may find handy. It has a built-in registry cleaner to clean the registry quickly, and a startup manager as well to stop the unrequired program from opening up at Windows startup. Furthermore, it also has a browser plugins viewer to let you see all the installed plugins in all of your browsers and easily disable/enable or delete them. This browser cleaner tool focuses less on cleaning the browser data and more on make it clean if it got hijacked by a rogue toolbar or home page hijackers. Auslogics Browser Care automatically detects modern browsers installed on your system (didn’t detect Opera for me) and lets you manage them all from a single interface. It has a simple option to select a home page and search engine for your browser, perfect in situations where your browser is hijacked, and you don’t know what to do. Furthermore, you can also manage your toolbars and add-ons right from its interface, including enable/disable and ability to delete from there. 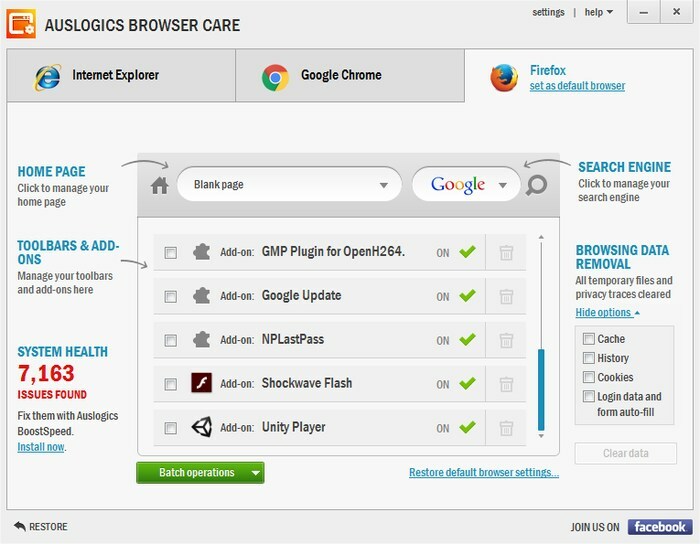 Even if there is a hidden add-on or toolbar, Auslogics Browser Care will be able to find it and then delete it. Apart from these options, it also has some options to clean browser data, including History, Cache, Cookies, autofills and passwords. Click&Clean is an extension for Chrome and Firefox that does a fantastic job of cleaning your PC and keeping it clean. The extension comes with tools for both the browser and your PC. Although you will have to download an optional 1MB program (automatically added) to use the PC cleaning features. It lets you clean browser data with a single click including history, cache, cookies, indexed databases, application cache, plugin-data and more. It has a “Securely close browser” options that closes the browser and eliminates all types of tracks that could be used to monitor any of your activity. There is also a “Privacy Test” feature to check your current privacy state, it can show location data (up to city), accounts you are logged into, the PC you are using, the browser you are using and more information that could be accessed by others. On top of that, it has a big list of features for Chrome only, including the ability to access plugins, experiments and extensions with one click, track network data being used, check DNS and conflicts and ability to see exactly what type of cache is stored. There is much more Click&Clean can do, and I haven’t even touched its options for PC cleaning, you should give it a try and explore it yourself. BleachBit is an open source browser cleaner tool with robust cleaning capabilities for both the PC system and the browsers installed. In its working, it is quite similar to CCleaner, but of course, some differences keep them apart. It divides all applications installed separately and the data they have covered listed below each one of them. You can easily select which data you would like to delete and which to keep. Talking about only the browsers, it can delete history, cache, HTML5 cache, sessions, URL history, passwords, downloads, fragmentations and search engines. Although the information to be deleted may vary from browser to browser. The data it deletes can also be marked to be overwritten, making it unrecoverable. Apart from cleaning all your system and browsers from one place, it also has a built-in shredder to delete files and folders permanently and make them unrecoverable. Similar to CCleaner it can also wipe free space to ensure no traces of deleted files are left behind. 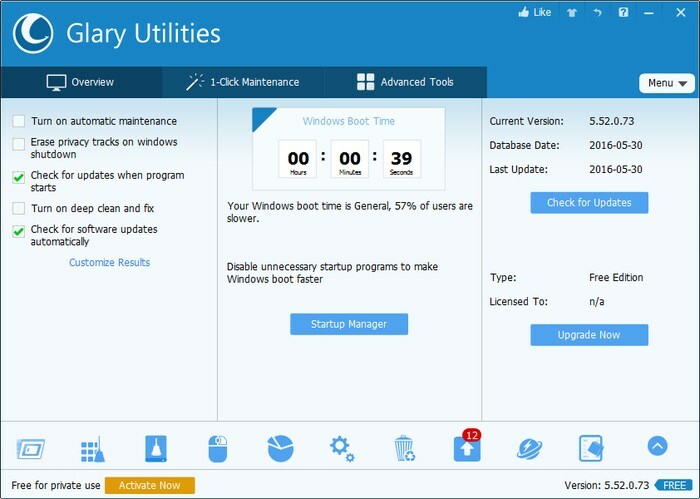 Glary Utilities is a set of utilities created to help keep your PC in its best state. With over 25 utilities, it also has some utilities for the browsers. It has a built-in browser assistant that lets you clean up all the modern web browsers installed on your PC. It will let you view all the history, cookies, extensions, plugins and search engines installed in your browser. From there you can see if there is any culprit and quickly delete it right from the Glary Utilities interface. 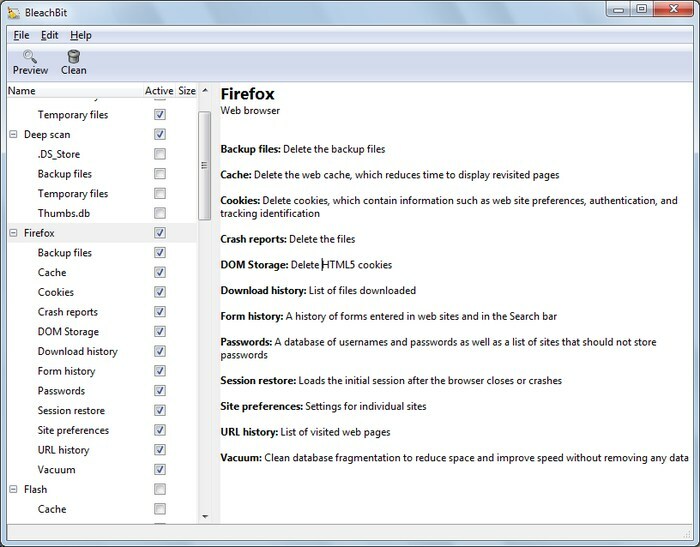 Furthermore, it has a “Tracks Eraser” utility that focuses on deleting all types of browser tracks that could be used to monitor you, including history, cookies, cache, passwords and form information, downloads and almost all kinds of tracks left due to Windows itself. 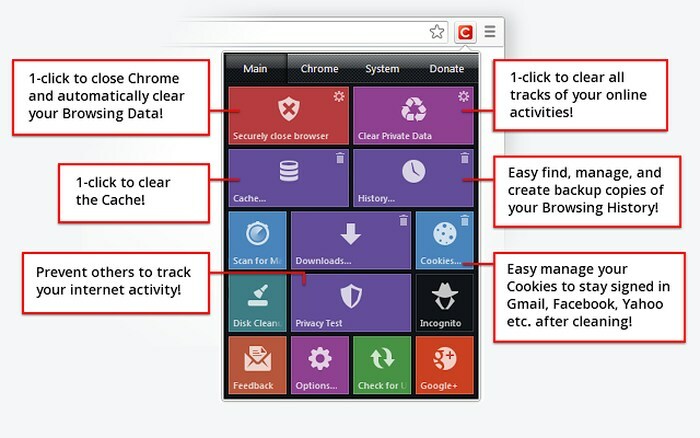 Apart from these browser utilities, it has a bunch of other handy utilities. These utilities include start-up manager, Registry cleaner/repairer/Defrag, Disk Cleanup/Analyzer, Context menu manager, Uninstall manager, software/driver updater, file splitter, Search feature, data recovery, Malware remover, duplicate file finder and few more. If you are interested in getting an all in one package that could keep both your PC and your browser in a safe condition, then Glary Utilities will do a great job. All the above mentioned browser cleaner tools can help your delete browser data and increase browser performance, and some just do it better or more easily. CCleaner should be your first choice if you are looking to delete browser data. However, if you are dealing with malicious toolbars and hijackers then give Auslogics Browser Care a try. Of course, if you want everything in one place, then you can go for Glary Utilities that are light and very powerful. You should also keep in mind that browsers store data for a reason, this data is used to speed up searches or make it easier to access websites. Like, browser cache is important for quickly accessing content without any need to download again, or the passwords saved in your browser allow you to enter password automatically without you needing to remember and enter manually. So make sure you only delete the data you don’t need, or is creating a problem for you. Otherwise, it can be quite hectic to build that data again every time. Previous: How to Clear Autofill: How to Delete Autofill in Chrome & Other Browsers?